USS Enterprise (NCC-1701) is a starship in the Star Trek media franchise. It is the main setting of the original Star Trek television series (1966–1969) and several Star Trek films, and it has been depicted in various spinoffs, films, books, products, and fan-created media. Under the command of Captain James T. Kirk, the Enterprise carries its crew on a mission "to explore strange, new worlds; to seek out new life and new civilizations; to boldly go where no man has gone before". Matt Jefferies designed the Enterprise for television, and its core design components — a saucer-shaped primary hull, two outset engine nacelles, and a cylindrical secondary hull — have persisted across several television and film redesigns. After the Enterprise's destruction in the third franchise film, that vessel's filming model was redressed and depicted as its successor starship, the USS Enterprise, NCC-1701-A. Initially a vision of the potential for human spaceflight, the original Enterprise became a popular culture icon. The vessel's original appearance influenced the design of subsequent franchise spacecraft. The model filmed for Star Trek has been on display for decades at the National Air and Space Museum. The Enterprise has repeatedly been identified as one of the best-designed and most influential science fiction spacecraft. We're [...] out in deep space, on the equivalent of a cruiser-size spaceship. We don't know what the mode of power is, but I don't want to see any trails of fire. No streaks of smoke, no jet intakes, rocket exhaust, or anything like that [...]. It will be like a deep space exploration vehicle, operating throughout our galaxy. The first color rendering of the Enterprise design; soon after, Jefferies would realize the design into a small wooden model. Note the prototypical elements used in Enterprise redesigns, other franchise vessels named Enterprise, and numerous other Star Trek spacecraft: a disc-like primary hull, a pair of offset engine nacelles, and a cylindrical secondary hull. Roddenberry further specified that the Enterprise would operate mainly in space, have a crew of 100-150, and be incredibly fast. Both Jefferies and Roddenberry did not want the Enterprise to look like any of the rocket ships already used by the aerospace industry or in popular culture; many of Jefferies' designs were rejected for being "too conventional". To meet Roddenberry's requirement that the ship look believable, Jefferies tried "to visualize what the fourth, fifth or tenth generation of present-day equipment would be like". Jefferies' experience with aviation led to his designs being imbued with what he called "aircraft logic". Jefferies imagined the ship's engines would be too powerful to be near the crew, requiring them to be set apart from the hull. While Jefferies initially rejected a disk-shaped component, worried about the similarities to flying saucers, a spherical module eventually flattened into a saucer. 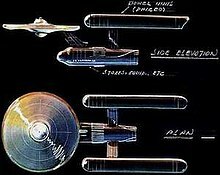 During one visit to Jefferies, Roddenberry and NBC staff were drawn to a sketch of the Enterprise resembling its final configuration. Jefferies had created a small model of this design that, when held from a string, hung upside-down — an appearance he had to "unsell". Jefferies kept the hull smooth, with a sense that the ship's components were serviced from inside. Some of Jefferies' rejected design concepts — such as spherical hull sections and warp engines that encircle a ship — inspired the design of future Star Trek vessels. The Enterprise was originally going to be named Yorktown, but Roddenberry said he was fascinated by the story of the actual Enterprise and that he had "always been proud of that ship and wanted to use the name." The ship's NCC-1701 registry stems from NC being one of the international aircraft registration codes assigned to the United States. The second C was added because Soviet aircraft used Cs, and Jefferies believed a venture into space would be a joint operation by the United States and Russia. NCC is the Starfleet abbreviation for "Naval Construction Contract", comparable to what the U.S. Navy would call a hull number. Jefferies rejected 3, 6, 8, and 9 as "too easily confused" on screen; he eventually reasoned the Enterprise was the first vessel of Starfleet's 17th starship design, hence 1701. The Making of Star Trek explains that USS means "United Space Ship" and that "Enterprise is a member of the Starship Class". The ship was changed to Constitution class with the release of Franz Joseph's Star Fleet Technical Manual in 1975. The first miniature built from Jefferies' drawings was a four-inch scale model. Desilu Studios, which was producing Star Trek, hired experienced film and television modelmaker Richard C. Datin to make a pre-production model. Datin used a subcontractor with a large lathe for major subcomponents and otherwise worked on the model for about 110 hours in November 1964. The 33-inch (0.8 m) model was made mostly of pine, with Plexiglass and brass details. Datin made minor changes after Roddenberry's review, and he submitted the completed model — which cost about $600 — to Desilu in December 1964. The 11-foot (3.4 m) filming model used for Star Trek. It appears here in the possession of the Smithsonian Institution, to which Paramount Pictures donated the model in 1974. Desilu then ordered a larger filming model, which Datin contracted to Volmer Johnson and Production Model Shop in Burbank. Datin supervised the model makers and did detail work on the model, which was constructed from plaster, sheet metal and wood. When completed, it was 11 feet 3.5 inches (3.4 m) long, weighed 125 kilograms (276 lb), and cost $6,000. The filming model was delivered too late to be used much for the initial pilot, "The Cage". The 11-foot model was initially filmed by Howard Anderson. When Roddenberry was approved to film the second pilot, "Where No Man Has Gone Before" (1966), various details of the 11-foot model were altered, and the starboard windows and running lights were internally illuminated. When the series went into production, the model was altered yet again, and the model was regularly modified throughout its active filming. Most of the fine details on the large model were not visible to television viewers. Howard Anderson could not keep up with the filming and special effects needs for regular production, so producers hired several other studios to contribute effects and additional footage. Motion control equipment was too expensive, so the ship was filmed with stop motion. Filming was often delayed by the heat generated by the studio and model's lights. Most third-season footage of the Enterprise was reused first- or second-season footage. Special effects were produced as cheaply as possible. The Enterprise was meant to serve as a familiar, recurring setting, similar to Dodge City in Gunsmoke and Blair General Hospital in Dr. Kildare. Reusing sets also helped address Desilu's budget concerns. As production continued, standing sets like the engine room and bridge became increasingly detailed. The bridge was monochromatic for "The Cage", but it was redecorated for "Where No Man Has Gone Before" because of the increasing popularity of color televisions. Roddenberry described the ship's hallways as "Des Moines Holiday Inn Style". The ship's chairs were manufactured by Burke of Dallas and similar to the original tulip chair designed by Eero Saarinen. Full interior deck plans of the Enterprise were designed by Franz Joseph in 1974, with approval from Roddenberry. At Roddenberry's direction, sound effects designer Douglas Grindstaff created different sounds for different parts of the vessel. Console sound effects were often created with a Hammond electric organ or other musical instrument, and engine sounds were created in part with a noisy air conditioner. Patent art submitted by Andrew Probert to the United States Patent and Trademark Office for a "toy spaceship" in the likeness of the redesigned Enterprise in 1979. Probert was granted the patent in 1981. A new Enterprise was designed by Jefferies for use on a planned Star Trek: Phase II television show, and some models were created. Jefferies began with the original Enterprise design and then identified components, such as the engines, that would have been upgraded. Some components, like the sensor dish, would move inside the ship to be more easily serviced. Abandoning Phase II in favor of producing Star Trek: The Motion Picture (1979) necessitated additional Enterprise redesigns: the film medium would resolve more detail than television. Although Jefferies left the project, his Phase II concepts provided the foundation for the Enterprise's film design. One of the most difficult challenges facing the film producers was recreating the Enterprise for film. Although art director Richard Taylor wanted to start over with designing the Enterprise for film, Roddenberry convinced him to continue working with Jefferies' design. Taylor brought on Andrew Probert to work with him on refining details for the ship. Probert added details such as phaser banks, control thrusters, and hatches for saucer section landing gears; Taylor redesigned the edge of the saucer and elements of the warp nacelles. Art director Joe Jennings and conceptual illustrator Michael Minor added additional details. David Kimble created diagrams and deck plans for the updated Enterprise that were provided to model makers, toy companies, and other manufacturers of licensed products. The Enterprise (left) in Star Trek II: The Wrath of Khan (1982). The heavily redesigned vessel, which debuted three years prior in Star Trek: The Motion Picture, nevertheless retains the same basic modules as the television model. In designing the Reliant (right), Joe Jennings and Mike Minor rearranged familiar components, such as the engine nacelles and saucer section, to establish its connection to the Star Trek universe yet distinguish it from the Enterprise. Jim Dow was in charge of building the model and creating the molds and structural processes. Paramount Pictures subsidiary Magicam spent 14 months and $150,000 to build the 8-foot (2.4 m), 39-kilogram (86 lb) model. An arc-welded aluminum skeleton ensured parts of the ship would not sag, bend, or shake when being moved. While the original Enterprise model was seen in only 17 poses, the new model had five points of articulation and could be shot from any angle. Paul Olsen painted the distinct "Aztec" scheme to provide an additional level of detail for the film screen and to suggest the presence of interlocking panels providing strength to the hull. The effect is made possible by small particles of mica in the paint, which alters its apparent color. However, the light flare created by the paint caused filming issues that made it hard to discern the edge of the ship against a dark background. Additionally, Trumbull and John Dykstra had problems with the Magicam model; Trumbull relit the ship as if it were an ocean liner, "a grand lady of the seas at night". A 20-inch (51 cm) model was used for long shots. Foundation Imaging created a CGI model of the ship for the 2001 director's cut of The Motion Picture. Production designer Harold Michelson was responsible for the ship's interior design, though director Robert Wise was responsible for the ship's drab interior color scheme. A new bridge had been designed and partially built for Phase II, and Michelson largely retained the design and its consoles. Rear projection films for bridge displays came initially from Stowmar Enterprises of Arlington, Virginia. When production exhausted the films faster than Stowmar could supply them, production designers manufactured their own from oscilloscopes, medical imagery, and an experimental computer lab. Corridors were initially a straight-wall design similar to the television series; Michelson changed them to an angular design with light radiating upward. Set designer Lewis Splittgerber described the engine room set as the most difficult to realize. Through forced perspective and small actors, the 40-foot (12 m) set was depicted as a 100-foot (30 m) engineering space. The model was refurbished slightly for Star Trek II: The Wrath of Khan (1982), with its exterior shine dulled and extra detail added to the frame. Industrial Light & Magic's (ILM) special effects team developed techniques to depict damage to the Enterprise without physically harming the model. ILM staff found the Enterprise difficult to work with: it took eight people to mount the model and a forklift to move it. For interior shots, the Enterprise was given a ship's bell, boatswain's call, and more blinking lights and signage to match the nautical atmosphere director Nicholas Meyer was trying to convey. David Kimble's deck plans from The Motion Picture influenced how previously unseen interior arrangements (such as the torpedo bay) were depicted in The Wrath of Khan. Recognizing the plot of Star Trek III: The Search for Spock (1984) was otherwise predictable, producer Harve Bennett decided to have the Enterprise destroyed. Though he meant for the event to be kept secret, news leaked. Visual effects supervisor Ken Ralston hated the Enterprise model and reveled in its destruction. Rather than damaging the large and expensive original model, several less expensive miniatures and modules were created and destroyed. One of the destroyed models had been created by Brick Price Movie Miniatures for Star Trek Phase II. Ralston had hoped the Enterprise's destruction in The Search for Spock would open the door to designing a new model for future films. However, producers for Star Trek IV: The Voyage Home (1986) decided to have the crew return to a duplicate of their previous ship. Although a new model was not created, it took ILM more than six weeks to restore and repaint the ship to appear as the new USS Enterprise, NCC-1701-A. Although the original bridge set had been refurbished and repainted to serve as the bridge for the Enterprise-A , it was scrapped in favor of a completely new bridge set for the fifth film. The sleek "Okudagrams" created for this Enterprise-A bridge were adopted in subsequent films and television spin-offs. When production began on Star Trek: The Next Generation (1987–1994), several interior Enterprise sets, such as the bridge, were redressed for use on the television show. Later, some Next Generation sets, such as the Enterprise-D's engine room and conference room, were modified to depict interiors of the Enterprise-A. The re-conceptualized USS Enterprise as it appears in the 2009 Star Trek film. This "alternate universe" ship retains the same core design as Matt Jefferies' original and includes elements from the previous films, such as the "Aztec" paint scheme. The enlarged engine nacelles emphasize director J. J. Abrams's desire for the Enterprise to feel like a "hot rod". The Enterprise was redesigned for the 2009 Star Trek film. Previsualization lead David Dozoretz credit the designers for overcoming the challenge of doing "a 2009 version of the '60s". Director J. J. Abrams wanted Enterprise to have a "hot rod" look while retaining the traditional shape, but otherwise afforded ILM "tremendous" leeway in creating the ship. Overall, according to production designer Scott Chambliss, the designers wanted the Enterprise to appear as carefully crafted as a luxury car. Concept artist Ryan Church retained much of the original Enterprise design and focused on the functionality behind the familiar components. His initial designs were modeled and refined by set designer Joseph Hiura. This design was then given to ILM for further refinement and developed into photo-realistic models by Alex Jaeger's team. ILM's Roger Guyett, recalling the original Enterprise as being "very static", added moving components to the model. ILM retained subtle geometric forms and patterns to allude to the original Enterprise, and the model's digital paint recreated the appearance of the "Aztec" hull pattern from the first films. Perhaps the most notable change was in the large engine nacelles, presenting a sleeker finish and shape to the otherwise simple nacelles of the previous ship. Sean Hargreaves' redesign of the successor NCC-1701-A "beef[ed] up" the vessel's support pylons, which are depicted as vulnerabilities in Star Trek Beyond (2016). According to Abrams, recreating the original bridge would have been ridiculous and too small. His enthusiasm for a new iPhone influenced Church's redesign for the bridge. Sophisticated technology became a motif on the new set, with multiple displays and computer graphics. The main viewscreen from the television series was kept, and giving different characters their own computer displays suggested the idea of a team working together. Because the original series transport room seemed flat to Abrams, he used swirling light and a moving camera to make the redesigned set and effects more dynamic. Because the budget prevented the creation of a huge, functional engineering room set, producers instead filmed in various portions of a Budweiser plant. Ben Burtt consulted with original series sound designed Douglas Grindstaff on sound design for the new Enterprise. Animators for Star Trek: The Animated Series (1973–75) rotoscoped Enterprise footage to recreate the ship's movement from the original series. This contributed to the impression of the animated series being a fourth season of the original series. The animated medium could not support some of the ship's lighter colors, so the Enterprise was depicted as a consistent gray. Although the ship's interior was largely recreated from the live action series, a second set of turbolift doors was added to the bridge in response to Roddenberry being asked, "What do they do if the doors get stuck?" Shortly after the animated Star Trek went off the air, pre-production began on Star Trek: Planet of the Titans. Ken Adam and Ralph McQuarrie designed a new Enterprise with a triangular hull that later inspired the appearance of the eponymous ship in Star Trek: Discovery. The Enterprise bridge was partially recreated for the Star Trek: The Next Generation episode "Relics" (1992). The original set had long been torn down, and producers initially planned to use the film-era set. Ultimately, a portion of the set was built and the rest filled in with archival footage and greenscreen technology. Some props and set pieces were rented from fans. Several years later, both the exterior and interiors of the Enterprise were created for the Star Trek: Deep Space Nine episode "Trials and Tribble-ations" (1996). Greg Jein created a model that was exactly half the size of the original 11-foot model, and it was the first production model of the starship to built in more than 30 years. As with "Relics", the bridge was partially recreated and other parts were later added digitally. Mike Okuda used a computer to recreate the graphics seen on the Enterprise sets, and others were drawn by artist Doug Drexler. Set designer Laura Richarz's biggest challenge was finding Burke chairs to populate the ship; she found a single one, and from that the production team made molds to create additional chairs. A CGI model of the ship makes a cameo appearance at the end of the Star Trek: Enterprise series finale, "These Are the Voyages..." (2005), and another CGI version was created for remastered episodes of the original Star Trek. Artists for the remastered Star Trek had to ensure the CGI model was not too detailed and therefore incongruous with the overall 1960s production. John Eaves, Scott Schneider, and William Budge redesigned the original Enterprise for Star Trek: Discovery (2017–present). The designers had an unusually long time to work on the ship: April to October 2017, whereas they usually had only a few weeks to design a ship. Other than a few small notes, the designers were given no explicit direction about the ship's appearance; Schneider called the redesign project the trio's "golden hour". They briefly considered but quickly decided against an appearance significantly different than Jefferies' original design. Eaves created 10 relatively similar sketches that streamlined the original Enterprise to appear more consistent with the sleek Discovery aesthetic; they selected one of the sketches to refine further. They developed the vessel with the assumption that components like the warp nacelles and impulse engines would be replaced over time; the modules for the Enterprise's appearance in Discovery are meant to appear more primitive than what is depicted in Star Trek. The designers tried to incorporate elements from other ships that precede and succeed the Enterprise, such as the 21st-century Phoenix in Star Trek: First Contact (1996), the 22nd-century USS Enterprise from Star Trek: Enterprise (2001–2005), and the successor USS Enterprise-B from Star Trek Generations (1994). They also included elements from the Enterprise refit for The Motion Picture. One distinct challenge was the hull: Jefferies design featured a smooth hull, but the lack of features would appear too simple on modern high-definition displays. The designers added details, such as phaser banks and control thrusters, that "must have been there" on the original Enterprise but were not depicted on the Star Trek models. The ship's scale also fluctuated, which meant the designers had to adjust the window sizes and patterns. Budge kept the designers in check with ensuring details and features added to the Enterprise were consistent with the design of other ships on Discovery. One such feature was whether the bridge would have a window: most Discovery ship bridges have a front-facing window, but the Enterprise had never been depicted like that. The solution was to depict the Enterprise bridge as having a large piece of transparent aluminum at its front that can become either transparent or opaque as needed. Eaves sent the design team's model to the visual effects team, which made further design changes. Discovery producer Gretchen J. Berg said she hoped fans see the appearance of the Enterprise in Discovery as a blending of old and new Star Trek. Another Discovery producer, Aaron Harberts wasn't worried whether fans were satisfied with the ship's redesign; while many of the staff who developed the new appearance are Star Trek fans, Harberts stated fans rarely agree on anything. Starfleet commissioned the Enterprise in 2245. Robert April is the Enterprise's first captain, succeeded by Christopher Pike. Pike leads the Enterprise for about a decade and is the commanding officer in the original pilot, "The Cage". Throughout the first live action and animated Star Trek television series, Captain James T. Kirk commands the ship on an exploration mission from 2264 to 2269. Star Trek: The Motion Picture begins with the Enterprise completing an 18-month refit overseen by its new captain, Willard Decker. Decker describes the refit vessel as "an almost totally new Enterprise". Admiral Kirk takes command of the ship to address a threat to Earth. Star Trek novels and other media depict a second five-year mission under Kirk's command between the events of the first and second films. Captain Spock commands the Enterprise, serving as a training ship, at the beginning of Star Trek II: The Wrath of Khan in 2285. Kirk assumes command to investigate problems at space station Regula 1. The USS Reliant, hijacked by Khan Noonien Singh, inflicts substantial damage to the Enterprise; Spock sacrifices his life to save the ship. After returning to Earth at the beginning of Star Trek III: The Search for Spock, Starfleet marks the Enterprise for decommissioning due to its damage and age. Kirk and his senior officers steal the ship as part of their plan to restore Spock's life. During their mission, a Klingon attack disables the ship. Kirk lures most of the Klingons onto the crippled Enterprise, which he and his officers set to self-destruct before abandoning ship. When Kirk and his officers return to Earth, Kirk is demoted to captain and given command of a new starship USS Enterprise, NCC-1701-A. The Enterprise-A is ordered decommissioned at the end of Star Trek VI: The Undiscovered Country. The 2009 reboot film, Star Trek, and its sequels occur in a different timeline than the original Star Trek. In the film, the Enterprise makes its first appearance while under construction in Riverside, Iowa, in 2255. Captain Christopher Pike commands Enterprise on its maiden voyage in 2258 to respond to a distress call from Vulcan. At the film's conclusion, James Kirk is promoted to captain and receives command of the Enterprise. The vessel is destroyed in Star Trek Beyond and a new Enterprise, NCC-1701-A, is commissioned under Kirk's command. The Enterprise's design is iconic, and it influenced all future Federation starships in the franchise. The ship's interiors are also iconic of 1960s design. Both io9 and Popular Mechanics called the original Enterprise the best version of the franchise's various ships named Enterprise. The New York Times called it "a joy" to see the redesigned original Enterprise in Star Trek: Discovery's second-season premiere. The two Enterprises overlap, and are clearly related, but they do not map completely onto each other. [...] Unpacking their distinctions illuminates the history of this significant television artifact and contributes to scholars' on-going analyses of popular and material culture. Time called the ship's redesign for The Motion Picture "bold" and "handsome". Harris lists the Enterprise as one of the 50 most significant objects in film, alongside the Ruby slippers in The Wizard of Oz, the Maschinenmensch in Metropolis, and the Batmobile in Batman Begins. In its review of Star Trek II, The Washington Post said the Enterprise looked "like a toy boat in a lava lamp". After being depicted as a complicated vessel requiring detailed care in The Wrath of Khan, Entertainment Weekly called it "a bit loony" for the Enterprise to be operable by just a handful of officers in The Search for Spock. The ship's destruction in The Search for Spock has been described as "truly iconic" and "a good way to go", though David Gerrold wrote that the ship's destruction "casts a pall" over the film that even Spock's resurrection cannot displace. In a 2010 retrospective of the Star Trek films, author Jill Sherwin suggests the aging Enterprise in The Search for Spock served as a metaphor for the aging Star Trek franchise. The starship Enterprise has had considerable cultural impact, and the original ship's model is "a living cultural object". Bjo Trimble said producers of the original Star Trek received more fan letters about the Enterprise than any of the actors. A write-in campaign in 1976 led to the first space shuttle being named Enterprise rather than Constitution. In 2009, Virgin Galactic named its first commercial spaceship VSS Enterprise to honor the Star Trek vessel. Build the Enterprise is a website that proposes creating a functional spacecraft with a hull similar to the Enterprise. The United States Navy evaluated the efficiency of the Enterprise bridge's style and layout, and the bridge of the USS Independence and the Ship's Mission Center of the USS Zumwalt have been compared to the Enterprise's bridge. An exacting replica of the Enterprise bridge created for a Star Trek fan series was later opened as a public exhibit. The distinct beeps emitted by R2-D2 in Star Wars are "an offspring" of the melodic sounds created for the Enterprise's bridge console. Paramount Pictures donated the original 11-foot (3.4 m) filming model to the Smithsonian Institution in 1974, disassembled across three crates and dirty. In shipping the model, Paramount estimated the value of the model at $5,000. Starting in 1976, it hung at an exhibit gallery entrance at the National Air and Space Museum before being moved to the gift shop, where it stayed for 14 years. In the first of its initial restorations, the model was altered to look more like the starship Enterprise and less like a studio filming model. The model underwent restorations in 1974, 1984, 1992, and 2016. For much of its time on display, fans have often been surprised at the differences between the actual physical model and their expectations about how the "real" spacecraft should appear. A substantial, multi-year restoration culminated in 2016 with the unveiling of a new display in the Milestones of Flight Hall. This most recent restoration highlighted the duality of the Enterprise as both a filming model and inspirational starship. In 2006, Paul Allen bought the Enterprise model created for the original Star Trek films for $240,000, and it is on display at the Museum of Pop Culture. Another model of the original film version is on display at aerospace company Blue Origin. The original ship's captain's chair sold at auction for $304,750. 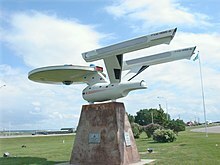 Vulcan, Alberta, created a 31-foot (9.4 m) model starship inspired by the Enterprise. The Enterprise design has been licensed for use in variety of games, models, and toys. Ballantine Books released a set of 12 Enterprise interior and exterior blueprints in April 1975, and by December 1976 they were in their seventh printing. The first run of a cutaway drawing of the Enterprise for The Motion Picture sold over one million prints. In 2010, Simon & Schuster's Gallery Books published a Haynes Manual for "owners" of the USS Enterprise. The United States Postal Service has released several USS Enterprise stamps. AMT's 1966 Enterprise model is one of the company's highest-selling kits. ^ a b c d e f "Enterprise, U.S.S." startrek.com. Retrieved August 26, 2018. ^ Franz Joseph Designs (1975). Star Trek Blueprints: General Plans, Constitution Class, U.S.S. Enterprise (2nd ed.). Ballantine Books. p. 4. Archived from the original on 2006-12-06. ^ Robinson & Riley 2010, p. 37. ^ Reeves-Stevens 1995, p. 29. ^ Robinson & Riley 2018, p. 8. ^ a b c d e "Star Trek Starship Enterprise Studio Model". National Air and Space Museum. Retrieved August 24, 2018. ^ Robinson & Riley 2018, p. 8-9. ^ Whitfield & Roddenberry 1968, p. 79. ^ Reeves-Stevens 1995, p. 9. ^ Robinson & Riley 2018, p. 8–9. ^ a b c d Gross, Edward; Altman, Mark A. (2016). The Fifty-Year Mission: The Complete, Uncensored, Unauthorized Oral History of Star Trek: The First 25 Years. Thomas Dunne Books. ISBN 978-1250065841. ^ "Evolution of the Starship Enterprise (2 of 28)". cbsnews.com. Retrieved August 25, 2018. ^ a b c Robinson & Riley 2018, p. 10. ^ Whitfield & Roddenberry 1968, p. 79-80. ^ Robinson & Riley 2010, p. 6. ^ "Evolution of the Starship Enterprise (3 of 28)". Retrieved August 25, 2018. ^ Robinson & Riley 2018, p. 10-12. ^ Robinson & Riley 2018, p. 12. ^ a b c Conway, Richard (May 16, 2013). "Star Trek, Before Darkness: 47 Years of Starship Designs". Time. ISSN 0040-781X. Retrieved August 25, 2018. ^ Robinson & Riley 2018, p. 150–151. ^ Gross, Edward; Altman, Mark A. (2016). "An Oral History of "Star Trek"". Smithsonian. Retrieved 2019-01-28. ^ a b "Interviews: Matt Jefferies: Why NCC-1701?". Archived from the original on September 1, 2006. Retrieved December 31, 2006. ^ a b Whitfield & Roddenberry 1968. ^ Robinson & Riley 2018, p. 13. ^ a b c d McCullars, William S. (2001). "Enterprise '64, Part 1". Star Trek Communicator (132): 51. ^ a b c d Weitekamp 2016, p. 5. ^ "Model, Starship Enterprise, Television Show, "Star Trek"". Retrieved 19 February 2015. ^ a b c d e f g Eaglemoss 2013, p. 17. ^ a b c d e Weitekamp 2016, p. 6. ^ a b Weitekamp 2016, p. 10. ^ Michelle, Donahue (August 2, 2016). "Five things only a conservator would know about the USS Enterprise". Smithsonian Insider. Retrieved August 28, 2018. ^ Solow, Herbert; Justman, Robert H. (1997). Inside Star Trek: The Real Story. p. 262. ISBN 0671009745. ^ Careless, James (2004). "From Model to CGI". Star Trek Communicator (148): 46–47. ^ "Star Trek: The 30th Anniversary". Cinefantastique. 27 (11/12): 67. ^ a b Pearson, Roberta; Davies, Máire Messenger (2014). "Star Trek and American Television History". Star Trek and American Television. Berkeley: University of California Press. pp. 23–24 – via EBSCOHost. ^ Gerrold, David (2014). "Star Trek—The Unfulfilled Potential". The World of Star Trek. BenBella Books. ISBN 9781939529572 – via EBSCOHost. ^ Reeves-Stevens 1995, p. 34. ^ Sackett & Roddenberry 1980, p. 89-91. ^ Benson, Paula (November 13, 2014). "The Tulip Chair in Star Trek - putting the record straight - Film and Furniture". Film and Furniture. Retrieved August 28, 2018. ^ a b Phillips, Elaine K. (May 15, 2013). "Eames on the Enterprise: The 1960s Interior Design of Star Trek". Retrieved August 28, 2018. ^ Newitt, Paul. "An Interview with Franz Joseph". trekplace.com. Archived from the original on December 31, 2004. Retrieved August 26, 2018. ^ a b c d Deb, Sopan (August 3, 2018). "Douglas Grindstaff, 'Star Trek' Sound Whiz, Dies at 87". The New York Times. Retrieved August 31, 2018. ^ a b Reeves-Stevens 1995, p. 181-182. ^ a b c Eaglemoss 2013, p. 12. ^ a b c Eaglemoss 2013, p. 13. ^ Robinson & Riley 2018, p. 26. ^ a b c Smith, Christopher (May 31, 2017). "See What Lies Behind The Hull Of The Starship Enterprise". Motor1.com. Motorsport Network. Retrieved August 28, 2018. ^ Reeves-Stevens 1995, p. 229-230. ^ Okuda, Michael; Denise Okuda; Debbie Mirek (1999). The Star Trek Encyclopedia. Pocket Books. ISBN 0-671-53609-5. ^ Tobias, Tracey (December 2001). "Redesigning the USS Enterprise NCC-1701". Star Trek: the Magazine. Fabbri Publishing. 2 (8): 85. ^ a b Sackett & Roddenberry 1980, p. 207. ^ Olsen, Paul (2013). Creating The Enterprise. Bristol, UK: STAR Books. pp. 91, 92, 93, 94. ISBN 0 9740407 11. ^ Hood, Jamie. "Probing the Ships of Star Trek: the Motion Picture". Round 2 Models. Retrieved October 22, 2013. ^ a b c d "How ILM came up with the new Enterprise for J.J. Abrams' Trek". Sci Fi Wire. 2009-04-17. Retrieved 2009-04-21. ^ Sackett & Roddenberry 1980, p. 210. ^ Eaglemoss 2013, p. 14. ^ Trimble, John; Trimble, Bjo (June 2010). Simpson, Paul (ed.). "Eye of the Beholder". Star Trek Magazine: 21. ^ Sackett & Roddenberry 1980, p. 85-91. ^ Anderson, Kay (1982). "'Star Trek II: The Wrath of Khan': How the TV series became a hit movie, at last". Cinefantastique. 12 (5–6): 50–74. ^ Reeves-Stevens 1995, p. 228-229. ^ a b Dillard, J.M. (1994). Star Trek: "Where No Man Has Gone Before" — A History in Pictures. Pocket Books. p. 79. ISBN 0-671-51149-1. ^ Nimoy, Leonard; Harve Bennett, Charles Correll, Robin Curtis (October 22, 2002). Star Trek III: The Search for Spock, Special Collector's Edition: Director's Commentary (DVD; Disc 1/2). Paramount Pictures. ^ a b c d Reeves-Stevens 1995, p. 258-260. ^ Reeves-Stevens 1995, p. 285-286. ^ a b Vaz 2009, p. 88. ^ Vaz 2009, p. 92. ^ Plant, Bob (2009-07-23). "Church of Trek". Round 2 Models. Retrieved 2009-10-04. ^ "Star Trek Beyond's new USS Enterprise, by Sean Hargreaves". thetrekcollective.com. 2016-08-06. Retrieved 2018-09-07. ^ Vaz 2009, p. 98. ^ Vaz 2009, p. 100. ^ a b Vaz 2009, p. 102. ^ Vaz 2009, p. 105. ^ Vaz 2009, p. 106. ^ a b Wright, Matt (November 18, 2006). "Star Trek: The Animated Series DVD Set Review". TrekMovie.com. Retrieved August 31, 2018. ^ "Star Trek: The Animated Series". Star Trek: The Magazine. 1 (16): 68. ^ Reeves-Stevens 1995, p. 70. ^ a b Robinson & Riley 2018, p. 14. ^ Britt, Ryan (July 24, 2016). "'Star Trek: Discovery' Design Is Straight Outta 'Star Wars'". Inverse. Retrieved March 10, 2019. ^ Nemecek, Larry (2003). Star Trek: The Next Generation Companion: Revised Edition. New York: Pocket Books. p. 219. ISBN 978-0-7434-7657-7. ^ a b Erdmann, Terry J.; Block, Paula M. (2000). Star Trek: Deep Space Nine Companion. New York: Pocket Books. p. 386. ISBN 978-0-671-50106-8. ^ Atkinson, Torie; Myers, Eugene (April 14, 2010). "Tribbles Week: Re-watching Deep Space Nine's "Trials and Tribble-ations"". Tor.com. Tor Books. Retrieved August 4, 2013. ^ Nemecek, Larry (January–February 1997). "The Making of Trials and Tribble-ations" (PDF). Star Trek: Communicator (110): 55. ^ a b Kerr, Greg (July 2012). "The Enterprise and Me: The long road to Polar Lights' 1:350 TOS Enterprise-Part One". Sci-fi & fantasy modeller. 26: 48–49. ^ Eaglemoss 2019, p. 6. ^ Eaglemoss 2019, p. 12–13. ^ a b Eaglemoss 2019, p. 7. ^ a b Eaglemoss 2019, p. 8. ^ Eaglemoss 2019, p. 8–9. ^ a b Eaglemoss 2019, p. 12. ^ Eaglemoss 2019, p. 15. ^ Eaglemoss 2019, p. 10. ^ Eaglemoss 2019, p. 16. ^ Eaglemoss 2019, p. 16–17. ^ Eaglemoss 2019, p. 17. ^ Eaglemoss 2019, p. 18. ^ a b Britt, Ryan (February 11, 2018). "'Star Trek: Discovery' Showrunners Explain Why the USS Enterprise is Back". Inverse. Retrieved August 31, 2018. ^ a b Harris, Scott Jordan (2013). Rosebud Sleds and Horses' Heads: 50 of Film's Most Evocative Objects. Intellect Books Ltd. p. 68. ISBN 978-1-78320-117-4 – via ProQuest. ^ Glancey, Jonathan (May 21, 2009). "Classics of everyday design No 61: Starship Enterprise". The Guardian. Retrieved August 28, 2018. ^ a b Whitbrook, James (February 21, 2018). "All 11 Versions of the U.S.S. Enterprise, Ranked". io9. Univision Communications. Retrieved August 25, 2018. ^ Carter, Alex (April 16, 2015). "Revisiting Star Trek III: The Search For Spock". Den of Geek. Retrieved August 27, 2018. ^ Moseman, Andrew (September 8, 2016). "Every "Star Trek" USS Enterprise, Ranked". Popular Mechanics. Retrieved August 25, 2018. ^ Deb, Sopan (January 17, 2019). "'Star Trek: Discovery' Season 2 Premiere: Ruffling Feathers". Arts. The New York Times. The New York Times Company. Retrieved March 10, 2019. ^ a b c Weitekamp 2016, p. 3. ^ Conway, Richard (May 16, 2013). "Star Trek, Before Darkness: 47 Years of Starship Designs". Time. ISSN 0040-781X. Retrieved August 25, 2018. ^ Reeves-Stevens 1995, p. 229. ^ Franich, Darren (May 13, 2016). "Star Trek III: The Search for Spock, Leonard Nimoy, and William Shatner". ew.com. Meredith Corporation. Retrieved August 28, 2016. ^ Collura, Scott (July 29, 2016). "Star Trek: A Brief History of Blowing Up the USS Enterprise". IGN. Retrieved August 25, 2018. ^ Graeme, McMillan (June 27, 2016). "'Star Trek': The Many Deaths of the USS Enterprise". The Hollywood Reporter. Retrieved August 25, 2018. ^ a b Gerrold, David (2014). "The Return of Star Trek". The World of Star Trek. BenBella Books. ISBN 9781939529572 – via EBSCOHost. ^ a b Caputo, Joseph (May 19, 2009). "How Big is the Starship Enterprise?". smithsonian.com. Smithsonian Institution. Retrieved August 31, 2018. ^ NASA (2000). "Enterprise (OV-101)". National Aeronautics and Space Administration. Archived from the original on March 26, 2015. Retrieved November 28, 2007. ^ "Virgin Galactic's Private Spaceship Makes First Crewed Flight". Space.com. 2010-07-16. Retrieved 2010-07-29. ^ Atkinson, Nancy. "Spaceship Enterprise in 20 years? Beam me up!". NBC News. Retrieved 7 March 2014. ^ Palis, Courteney. "Engineer Wants Us To Build Real-Life Starship Enterprise". The Huffington Post. Retrieved 17 March 2014. ^ Wright, James W. (March 26, 2018). "Here's how Popular Science covered 'Star Trek' in 1967". Popular Science. Bonnier Corporation. Retrieved August 31, 2018. ^ Griffin, Matthew (October 7, 2016). "Capable of full autonomy, we go inside the stealth destroyer USN Zumwalt". Global Futurist. Retrieved October 17, 2016. The SMC looks like a miniature version of a war room at the Pentagon and works in a similar fashion to the bridge seen on Star Trek. ^ Locke, Charley (December 7, 2016). "An Elvis Impersonator Built an Exact Replica of the Starship Enterprise". Wired. Condé Nast Publications. Retrieved August 25, 2018. ^ Weitekamp 2016, p. 7. ^ Weitekamp 2016, p. 7-8. ^ Whitley, Jared (January 26, 2015). "Smithsonian Brings Original Enterprise Model Back for One Day Only During Major Restoration Effort". TrekMovie.com. Retrieved August 27, 2018. ^ Paul, Richard (April 13, 2016). "The Smithsonian gives the USS Enterprise an honored place in the Air and Space Museum". Public Radio International. Retrieved August 24, 2018. ^ Weitekamp 2016, p. 12. ^ Boyle, Alan (2016-03-09). "Jeff Bezos lifts curtain on Blue Origin rocket factory, lays out grand plan for space travel that spans hundreds of years". GeekWire. Retrieved 2018-09-08. ^ Ryan, Joel (May 19, 2006). "Where No Auction Has Gone Before". E! News. Retrieved August 31, 2018. ^ "About Vulcan, Alberta's Star Ship FX6-1995-A". Archived from the original on 2010-07-02. Retrieved 2010-07-29. ^ Weitekamp 2016, p. 8. ^ Robinson & Riley 2010. ^ "Iconic TV series Star Trek Forever stamps released". United States Postal Service. 2016-09-02. Retrieved 2018-09-09. ^ Kelly, Scott (2008). Star Trek The Collectibles. Iola, WI: Krause Publications. p. 169 – via EBSCOHost. Eaglemoss (2013), U.S.S. Enterprise NCC-1701 Refit, Eaglemoss Productions Ltd.
Eaglemoss (2019), U.S.S. Enterprise NCC-1701 Special Issue, Eaglemoss Productions Ltd.
Robinson, Ben; Riley, Marcus (2010). Star Trek: U.S.S. Enterprise Owners' Workshop Manual. Haynes Manuals. Gallery Books. ISBN 978-1-4516-2129-7. "Conserving the Star Trek starship Enterprise Studio Model". Smithsonian Institution. June 27, 2016. Retrieved August 31, 2018. Hamill, Jasper (April 24, 2017). "Fascinating blueprints show early designs for iconic spaceships from Star Wars and Star Trek films". The Sun. News UK. Retrieved August 28, 2018. Redd, Nola Taylor (July 3, 2012). "Could We Build 'Star Trek's' Starship Enterprise?". Space.com. Retrieved August 31, 2018.